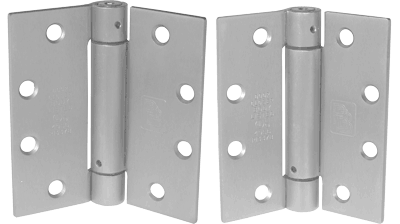 •Spring hinge door closer Model K8107/K5107 passed a 1,000,000 cycle UL test in accordance with Underwriters Laboratories for door closers, with or without integral smoke detectors. •UL listed for doors up to 4' x 8', wieghing up to 180lbs. Both models comply and meet ANSI/BHMA specifications for ANSI/BHMA A156.17 Grade 1 and bear U.L.’s listing mark. All hinges are ANSI template. 4 1/2 " x 4"